Google has unveiled a new product that is intended to teach kids how to programme without having to learn traditional coding. Part of a research partnership between Google, Paulo Blikstein of Stanford University, and design-firm Ideo, Project Bloks taps into kids’ inherent learning techniques. The idea is based on a concept called tangible programming and involves a collection of boards and so-called “pucks” that can be arranged to provide different commands and outcomes. These connect to a Project Bloks “Brain Board” that enable the blocks to communicate with and control toys and other smart devices. But Google isn’t about to become a toymaker. The tech giant says the blocks have primarily been designed as a platform that partners can use as a basis for educational tools. Google’s thinking is that by using this model (the Android model, essentially), toymakers will be able to building coding products and a wider variety of toys will be put out into the market. 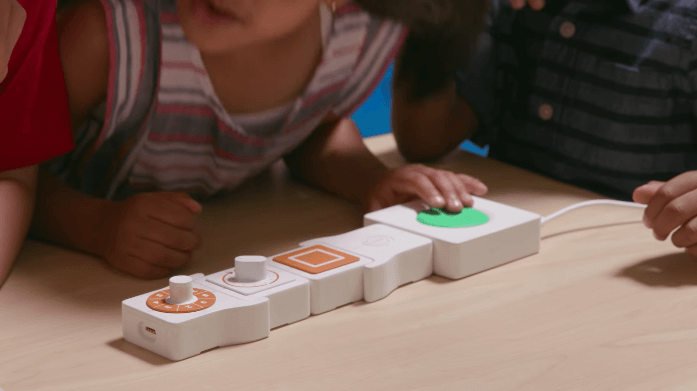 Demonstrating how such products might work, Google has released video footage of children controlling the movement of a toy robot by using the bloks. Another example shows how the bloks can be used to compose music and send it to a wireless speaker. “One of the big things about teaching kids how to programme is that they can express ideas that they wouldn’t be able to express otherwise,” Blikstein said in a video demonstration of the product.